“When lifelong friends Julie and Rosanna are electrocuted by an ancient Betamax VCR, they wake up as the main characters in their favorite 1980s teen movie. How will they get back to reality... and do they really want to? For Rosanna - eternal adolescent, reluctant single mom and frustrated artist - being zapped into an eighties teen movie is a dream come true. She's the coolest girl in school with a hot, mysterious boyfriend, a doting father who'll give her anything she wants and a scholarship to study art in Paris. Why would she ever want to leave? For Julie - Miss Responsibility - this is her worst nightmare. She's the sidekick in her own favorite movie and the boy of her dreams - Johnnie - is hopelessly, unrequitedly in love with Rosanna. Julie is determined to get back to reality. “In the past fifteen years, I’ve had a lot of different jobs that all had one thing in common: I helped other people to realize their creative dreams… spent some years freelancing as a script editor and drama development producer for a few different production companies, producing a few short films in between. This was great, but truly badly paid and it left no time for any writing of my own, so when I was approached by Birmingham City University and offered a job in their Digital Media School, the lure of holiday pay and private medical cover proved too much. Trapped in an 80s Teen Movie is Michelle Duffy’s debut novel. To learn more check out Ms. Duffy’s website or follow her on Facebook. While this story is original and smartly told it draws heavily on some of our favorite characters and scenes in a mashup from several 1980 teen movies, weaving Julie and Rosanna’s characters into the plot. It was a lot of fun reminiscing; it has been many years since I have seen a lot of these films. Julie and Rosanna are both in their late thirties and get together every Friday evening for a girls’ night. Both are disillusioned with the way their lives have turned out for very different reasons. 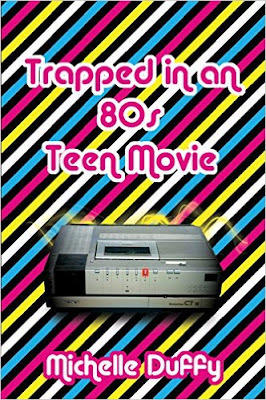 This week Julie decides so have a movie night with her friend after she comes across an old Betamax VCR and several favorite movie tapes they enjoyed when they were in high school together. Things are going along great as they enjoy vodka fruit smoothies, cake, and old eighties teen movies. At least things were going fine until the Betamax starts smoking and one of them grabs a cake fork to pry the movie out and *BAM*, both women are electrocuted. Somehow they are both thrown back twenty years in time and wake up in separate houses. Both Julie and Rosanna are again eighteen year-old high school seniors and are now the stars in their own movie. Julie finds herself in what she always considered the perfect loving family she never had. Rosanna is the only daughter of a doting single father. At first they both think it is all a dream, but it proves otherwise. When they make it to school things play out like the beginning of their favorite movies. They are greeted by friends who think they have always known them. Except for the hot new boy in school who happens to be Rosanna’s heart throb in the movie they had been watching. I know it sounds like this book should be full of clichés, but it isn’t. It addresses some weighty subjects that both Julie and Rosanna are forced to reassess. Things they found lacking in their old lives are brought to the forefront and must be looked at with different eyes. Julie, being the responsible one, wants to find a way back home even though she has very little to get back to. That is until Johnny starts paying attention to her instead of Rosanna. Johnny was always her favorite character in the movie. She has secretly carried a torch for him all these years. I found this an enjoyable blast from the past that I am sure many will enjoy. The characters are likeable and relatable. The dialogue was realistic for all concerned. From Rosanna with her teen-aged son and later with her pseudo father to her best friend Julie. I also found the twist at the end heartwarming for both Julie and Rosanna. So add this to your summer vacation reading list today. I came across a small number of proofing issues in the file I was given to review, nothing that really threw me out of the story. This sounds like a fun, nostalgic read. Going to Amazon now! I hope you enjoy this as much as I did, Lori Johnston. Thanks for stopping in and commenting.